Pumpkin Spice Lattes have become a bit of an autumn fad in recent years. Pumped out of high street coffee shops from September until December, the PSL is an incredibly popular seasonal drink. But loaded with sugar, preservatives and artificial colourings, it’s not the healthiest. Up until last year, the Starbucks version didn’t even contain any actual pumpkin. 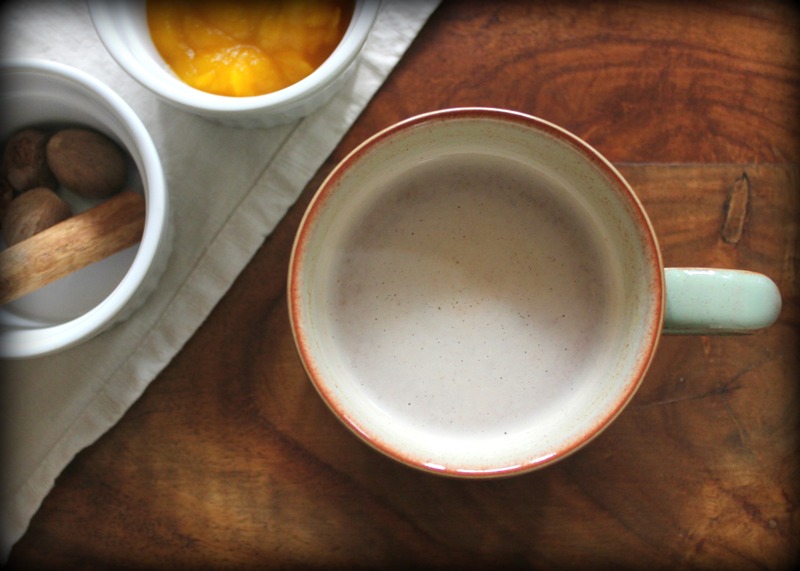 With a tub of fresh pumpkin puree in my fridge and a spice-rack exuding all my favourite festive aromas, I set about making my own pumpkin drink; one that would be warming and comforting on chilly autumn nights, but with the added bonus of being free from caffeine and artificial nasties. Plus, it would include a hefty dollop of homegrown pumpkin goodness in there. If you’ve got a stash of pumpkins, I highly recommend pureeing some to have on standby. 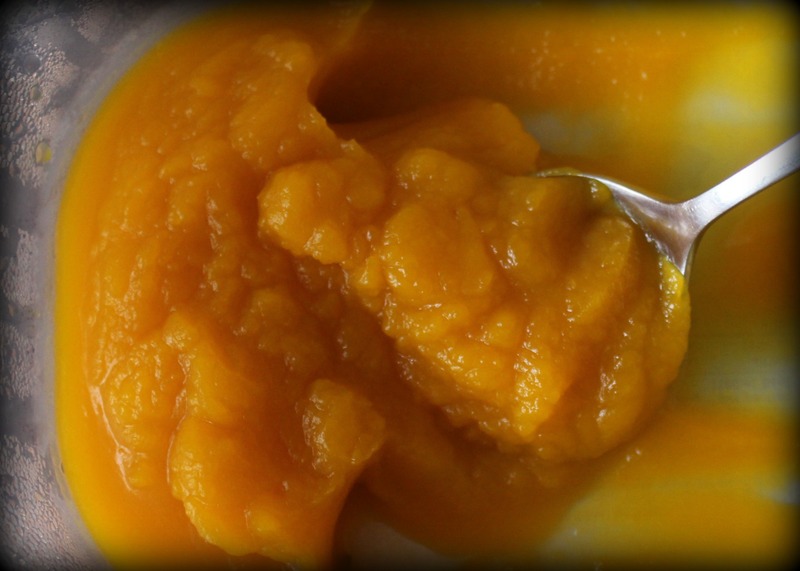 Pumpkin puree can be thrown into cake and bread mixes, pies, soups, sauces, the list is endless. 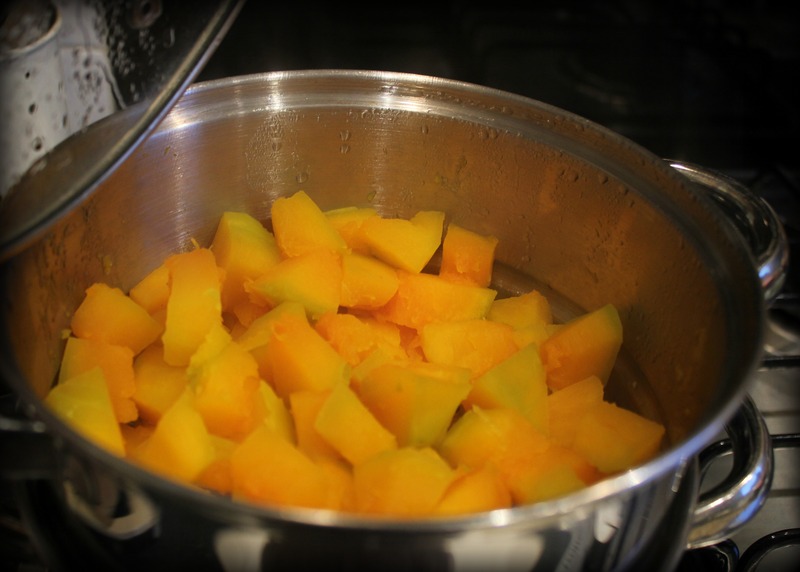 I peel and dice my pumpkins and steam them for 15 mins (either on the hob or just in a bowl in the microwave – no need to add water) before blitzing them in the blender. The puree keeps well in the fridge for up to seven days. After a few attempts to perfect the ultimate Spiced Pumpkin Milk (and having regained the feeling in my mouth after I managed to anaesthetise it with an overload of ground cloves during an earlier failed attempt) I hit on the perfect mix. This really is Christmas in a mug AND it’s good for you! By all means swap things around if you fancy. I’ve also made it with cow’s milk, but I prefer it with almond milk; the sweet nuttiness blends perfectly with the spices. 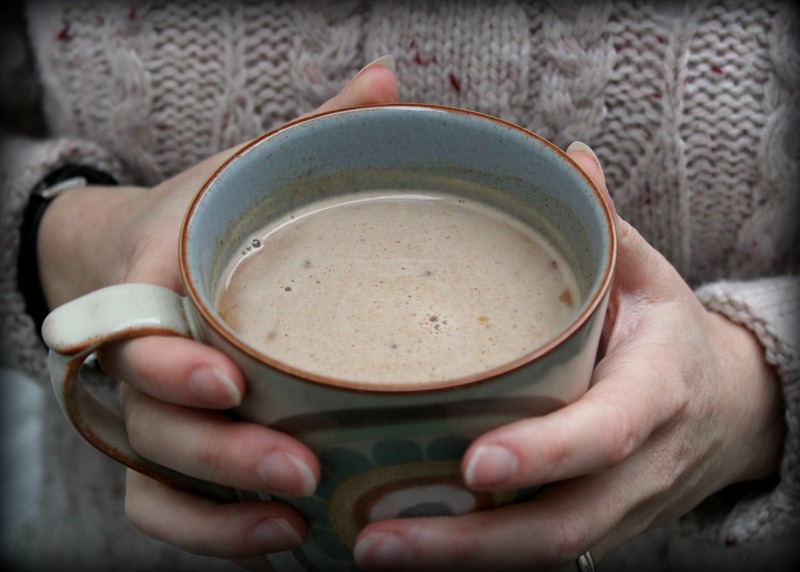 Rich, creamy and indulgent, it’s the ideal drink to warm your cockles after a hard day toiling at the allotment. Add the pumpkin and maple syrup to the mug and top up with the rest of the milk. Mix thoroughly again before heating in the microwave for 1 minute. Mix again and microwave for a further 30 seconds. Give a final good stir and serve. Mmm…now that sounds delicious! Still have two pumpkins to cut up and eat so will have to give this a go. Well done on your recent award too! Thank you! 😀 Hope you enjoy the Spiced Pumpkin Milk, it tastes quite naughty and indulgent, when actually it’s packed full of the good stuff!